Any business with customers is in the people business. Therefore, it is vital that you treat them with the respect and service they deserve. When you improve your customer relationships, you get to know them, you increase their trust in you, and as a result, they’ll become more loyal to your brand. Better relationships with your audience leads to a higher retention rate that is oh so important for businesses. Well, first off, loyal customers are on average worth up to 10 times as much as their first purchase. And like that wasn’t enough, the probability of selling to an existing customer is 60-70% while the probability of selling to a new prospect is only 5-20%. Last but not least, it is 6-7 times more expensive to acquire a new customer than it is to keep a current one. I think we can without hesitation say that improving your relationships with your already existing customers is tremendously important. Maybe even more important than going out and hunting for new ones. Building your relationships with your audience can be hard, and it can be easy. Thankfully, with social media, it is the latter. By following some simple measures, and following a formula to building your relationships on social media, you can do just that. In this article, that’s exactly what you’ll learn. The marketing team needs to ask when they don’t know the answer to something. If you respond to questions you don’t really know the answer to, people will be able to tell. And you won’t benefit from it. Sure, everywhere we go, we get to hear the importance of responding to customer inquiries quickly (more on that later), but the fact of the matter is that it’s better to respond a few minutes later with a good response than to respond quickly with a bad response that shows you don’t really know the answer to that question. How often do we trade factual accuracy and thoughtfulness for immediacy? What it will come off as is that you don’t really know what your are doing. And as someone who works within the company, it is your duty to know the answers. There’s a simple solution to this. Putting experts to do the job of customer interaction. The term expert is thrown around a lot. Even so much that it is included in several articles about “terms you need to stop using on social media”. Why? because the term is being used so widely on social media that it has lost its power and true meaning. Anyone can call themselves an expert. Especially on social media where you can practically build an image of yourself that is false. The only difference here is that you are actually going to use real experts, that are professionals within defined areas. You won’t explicitly say that experts are responding to their questions. After all, it will be noticed in the quality of the response they give that they are experts. According to Sprout Social’s Q1 2017 Index, only 1 in 10 social media messages to brands receive a response. This depends on several reasons. The most common ones are that the brand don’t have the resources to answer them all, and that the brand is too proud to admit that they don’t know the answer (more on that in the next point). The experts are already within your team! You don’t have to hire a bunch of new people to act as experts on your social media inquiries. And for small businesses, hiring new people simply costs too much. On social media, you will receive a ton of different questions. Some might be product related, other might be brand related, and some might be directed towards your managers. You can have a social media manager that manages most of your customer inquiries, but when they can’t answer, they should ask the people in your team who knows the answer and can give the answer your customers are looking for. Having your team on the same page will let you provide your customers a better experience with your brand which will lead to a higher retention rate and a bigger trust in your brand. Ultimately, these things will lead to more sales. Therefore, it is essential that you make sure you work together with your team and manage your customer service thorough better task management and assignment so the right questions reaches the right team. Apart from what many tend to believe, it’s okay to not know everything. And it’s okay to admit when you don’t! However, something that people hate is when someone pretends to know but clearly don’t. 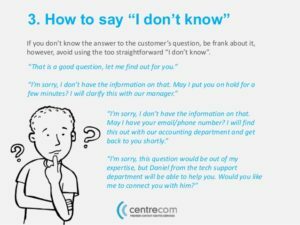 According to consumers, customer service agents failed to answer their questions 50% of the time. That’s quite a big number. If you don’t know the answer to a question someone asked, then tell them! But don’t just leave them hanging, though! Shakespeare famously wrote “The fool doth think he is wise, but the wise man knows himself to be a fool.” and this is something that you, including everyone in your team should follow. This stretches much further than solely social media customer interaction, but it very well applies there too. The best solution when you don’t know the answer is to tell them that you don’t know, but that you are going to find the answer to their question. What you’ll find is that your message will be greatly appreciated, because it helps humanize your brand. Everyone knows that no-one knows everything. If you pretend like you do, they won’t see your brand as human, and the gap between your brand and your customer will increase. As long as you get back to them with the answer to their question, that is. Every now and then, I come across brands that do this, and I smile every time I do. It seems like the greater the company, the more important it is to know the answer to everything. Even if the reality is that the people working there don’t necessarily know more than those within smaller organisations. The saddest part is that the largest brands are usually the ones that needs to be humanised the most, and by answering to every question with the mindset “I know it all” rather than with the mindset “I don’t know everything, but I am eager to learn”, they are missing out on tremendous opportunities. We all know that urgency in customer service is extremely important. But as we just discussed, we also know that urgency should not be prioritized before quality. You might be surprised hearing this, but it is actually possible to provide your customers with quality responses quickly. With the help of experts and the right resources, you can provide customer service that contains the best of both worlds, and that makes the recipe to a great customer service and happy customers. 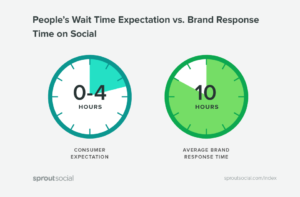 In the graph, we could see that the customer expectations of the response time is 4 hours, but in reality, brands take an average of 10 hours to respond. If you want to avoid losing customers, it’s not enough to simply answer to the messages you receive. You have to do it in a timely manner as well. People don’t want to wait half a day to get their simple question answered. Also, if the message is a complaint, letting it go unanswered is even worse. Know that the customer complaint is probably going to be there for the whole world to see, and how you respond to that message doesn’t only show the person who wrote it your brand’s personality and ambition, but it also shows everyone else about it too. When a message go unanswered for a long time, it will send signals that you don’t care about your customers, and that everyone who complaints go ignored. Many brands are doing everything in their power to hide negative complaints about their brand from the public, but something that is often not thought about is that a negative message actually can benefit your brand. Respond to it promptly, and give a response that satisfies and shows that you really do care, and the negative complaint will be converted into something positive for your audience to see. The result will be that it no longer puts your brand in a bad light, but rather shows that you value your customers and care about the experience they have with your company. Yes, the response you give is greatly important, but so is the time it takes for you to respond to it. When you are managing customer service in the more traditional ways such as email and live chat, you track the interactions, right? Well, it should be no different on social media. Have you ever gotten an email after you have reached out to a brand that asks you to rate your experience? 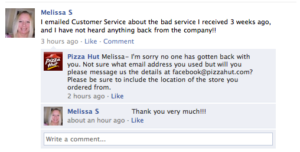 That’s one of the ways for brands to follow-up on customer interactions. customer relationships aren’t built after one interactions. No. They’re built in the same way as a long-term relationship. When managing customer service, you need to invest in the future and this mens tracking your conversations, social engagements, and other metrics that is valuable for customer service on social media. We’ve spoken about the importance of customer retention, and this is an important part of that. Just because you have the ability to reach billions of people right at your fingertips doesn’t mean you should. Instead, you should manage the relationships you already have to make them better. It simply isn’t enough to engage with them once. You need to put great emphasis on continually providing value so you are always on top of your customers’ minds. For customer service on social media, it’s about tracking every single stage of the buyer journey so you can convert one time customers into lifelong supporters. Having a conversation history is the first step to tracking and managing your customer interactions. By having one, it makes it easier to consistently communicate with them in the same way through the whole experience. Secondly, the more knowledge you have about the people you’ve interacted with before lets you give them better help in the future. Knowing things like previous issues, complaints, and personal information is vital in these situations. When you know where they are in the buyer journey, you can engage with them when they need you the most. This means responding to questions they need help answering, or even being one step ahead and answering questions they didn’t even know they needed help with. While doing so, it is also essential that you add a touch of personality. When interacting with someone once, it is hard to build any real trust. But when you do it over and over, that’s when you have the ability to really impact them and build their trust in you. I’ve several times spoken about the importance of keeping a consistent brand message with the help of visual content, but something that shouldn’t be neglected is the voice and personality you show with the written word. Every time you write something, a personality is presented behind it. When you have a team of different people that respond to messages, the brand voices can quickly sound differently. As a brand, you want to decide on a personality you want your brand to have and then stick to it. Therefore, it is important that you have a clear strategy and plan that tells everyone how they should respond to messages, and what voice they should use. 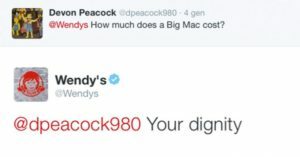 Wendy’s, for example is a very famous example of a brand that has chosen to go with a bold and sometimes even controversial personality, and this is reflected in every single response they send to their customers. 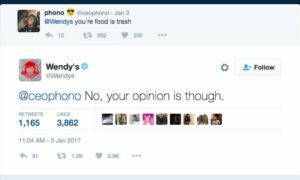 Wendy’s clearly knows their target audience and what language they resonate with, and therefore, their edgy language works really well. For other companies, it might not work as well. Therefore, it is important that you decide on a clear road you want to takes and then get everyone in your team, especially those who respond to customer inquiries on social media on board with it. Maintaining a consistent brand voice helps you drive your overall identity. When you have a consistent personality, people will be more comfortable with your brands and they’ll be able to resonate better with it. Best of all, having a consistent brand voice will help you build your relationship with them in a much more effective way. Because your customers know where they have you, and they know what kind of “person” you are. If I ask you what language and personality your best friend has, what would your answer be? If I asked the same question about your favourite brand? The point is that both of these should be able to get an answer because they should both have a consistent personality. Unless your friend is bipolar. You should always strive for better relationships with your customers. Social media is no exception. In fact, social media is a tremendous tool for building strong and valuable connections with your customers. By building relationships wth them, you can increase out retention rate, get them to become returning customers, and long-time supporters of your brand. Always treat your customers with respect and that respect will be returned.